Our Chincoteague Bed and Breakfast is just minutes from the Chincoteague National Wildlife Refuge on Assateague Island. Many know the refuge as the home of the Chincoteague wild ponies, which are indeed remarkable to behold. Yet Assateague Island is also an important site for resident and migratory waterfowl. Thousands of birds rest and feed in the protected areas of Assateague Island each spring and fall. Birders and photographers are invited to witness this natural spectacle during the Assateague Island Waterfowl Week, which is in its 37th year. In 2011, it takes place from November 19 to November 27. This is an ideal time for birders and photographers to stay at our Bed and Breakfast on Chincoteague Island. 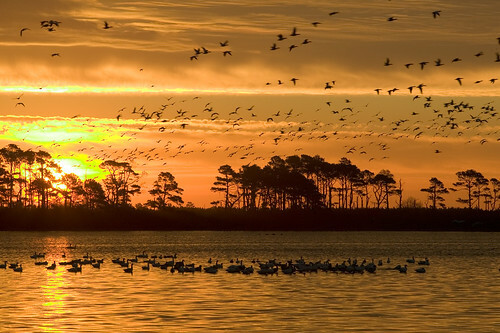 The Chincoteague National Wildilfe Refuge is comprised of more than 14,000 acres of maritime forest, saltwater marsh, freshwater marsh, and beach. During the Assateague Island Waterfowl Week, visitors are invited to explore parts of the refuge normally closed to the public. This is a spectacular opportunity. Join in special guided walks through the refuge and participate in the many special events and programs that will take place throughout the week. The waterfowl migration is expected to be at its peak the week of November 19, 2011. Expect to see large numbers of Herons, Snowy Egrets, and Snow Geese. Double-crested Cormorants are abundant in the fall, and both Tundra and Mute Swans are common. Watchers with binoculars, a telephoto lens, sharp eyes and patience will be richly rewarded.